IMHO for anyone interested in monitoring their heart, the Apple Watch 4 is a killer deal. For me it's the dramatic new speed, and the larger screen. Despite the AW3 being improved, it still got hung-up on certain screens, such as loading the Home app (I have lots of devices & scenes) or Workouts (if you left it on a prior workout summary). All gone now -- everything loads instantly. I have a healthy heart, but I would not consider doing WITHOUT this cutting-edge technology, or Apple’s other innovations either. It is not that expensive — a few dollars a week. The make-believe technologies that we see in the movies will in real life be designed and sold by Apple, Inc. Apple Watch is one of them. Yep. I'm still rocking an iPhone 7 Plus with no desire to upgrade, but I updated my Series 3 for a Series 4 with pleasure. Afib not immediately life threatening might be true, but it depends on how long a person is experiencing Afib. Afib can cause arteries to clog, especially the carotid artery, leading directly to a stroke and death. When you see a loved one die in front of your eyes due to undiagnosed Afib leading to stroke and death, one doesn't view Afib so cavalierly by saying it is not life threatening. Afib is an irregular heart rhythm that increases risk of stroke, among other things. There are other irregular heart rhythms besides afib that do not have the associated risk of stroke. A typical ECG is called a 12-lead ECG (I still call it an EKG), and allows us to “see” the heart electrical conduction/rhythm from multiple viewpoints, over a few seconds of time. This way, we get a much better view of what’s going on, allowing us to differentiate between the rhythms (we can see other stuff as well, but that’s another topic). 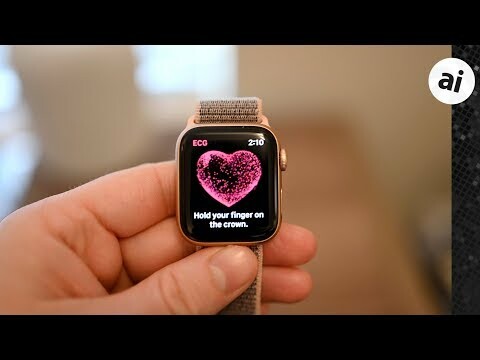 The Apple Watch does not utilize multiple leads, so we only see the heart’s electrical conduction from a single perspective, but many times, that can be good enough. Afib causes blood flow from the top chambers of the heart to be inefficient, and not empty as well. There is a tiny pouch adjacent to one of the chambers called the left atrial appendage. Normally, the blood gets squeezed out of the pouch with every heartbeat. With afib, the blood doesn’t empty out all the way. Blood that isn’t moving can clot. A clot in the pouch can later dislodge and go to the brain to cause a stroke, or can go to other organs and cause serious damage. Clots can from in other areas of the heart, but this is the “classic” example. The increased risk of stroke is based on several factors, and varies from person the person with afib. The risk is usually a few percent per year. People with afib get put on blood thinners and other medications to reduce this risk. Afib can cause problems in other ways: low blood pressure, low energy, reduced ability to exercise, heart failure, etc., especially if if the heart rate with afib is very fast. If your watch or other source says you have afib, you should always get it checked out by a physician immediately, for the reasons above, and because it’s usually easy to treat. Source: I’m an ICU doctor who sees this all the time. This is very interesting. So you think the ECG on the Series 4 is worth having, or the continuous pulse reading that all Apple watches can do is good enough to recognise it? I am uncertain how the continuous pulse reading on the Apple Watch distinguishes between the various irregular rhythms (one of which is afib), or if, in fact, it does. If Apple has algorithms to accurately detect afib with the pulse readings, that would make the ECG on the Series 4 little more than a novelty to most lay people, with the exception that you could show the ECG to your doctor. To a physician, the ECG on an Apple Watch offers much more information that a simple yes/no on afib. There is potentially a wealth of information about a myriad of heart issues. This potential makes me think that Apple may later expand the problems that can be automatically detected. For example, there is another irregular rhythm called aflutter (atrial flutter instead of atrial fibrillation). They both carry the risks for stroke, and are treated much the same way. I definitely think that over the next several years, we will see an increased ability for the watch to detect health issues. Roake - thank you for taking time to share your feedback. I work in IT at an academic medical center. Being a small part of what people like you do everyday is truly a gift. This week my team deployed a predictive model that uses multiple real-time factors to detect the presence of sepsis for a patient currently in the hospital. It alerts the medical team, who use established protocols to verify the prediction, and if so, commence with treatment. Early detection allows for earlier treatment - essential for saving lives. These tools such as the watch are imperfect to be sure, but exciting to see their use increasing. What? They mean my watch is not actually a licensed and trained medical doctor? Shocking! Down with Apple!